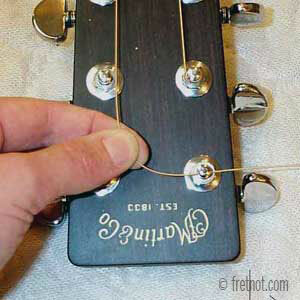 One reason we need to re-tune an instrument frequently is string slippage. 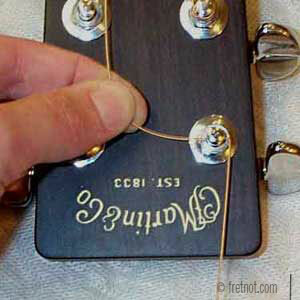 Strings need to be anchored securely at the bridge and at the tuning machines to insure they do no slip and loose tension. Turn the tuning machines heads so the post hole is pointing to the side. Bring the string down the center of the peghead and thread it thru the hole. 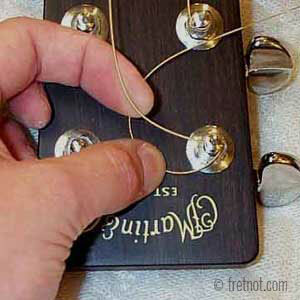 Leaving a bit of string length to wind around the tuner, bend the string slightly towards the top of the peghead. 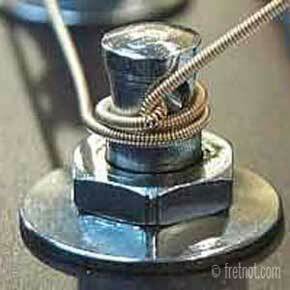 You don't want to bend the string more than once (back and forth will fatigue the wire and break it). 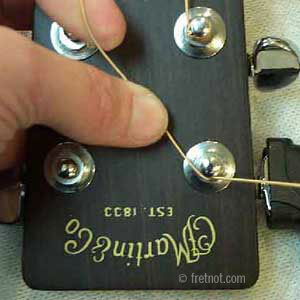 Bring the string back towards the center of the peghead and under the string. Keeping tension on the string with both hands, pull the string over itself. Holding tension on the string while bending can not be understated, it keeps gaps from forming. While you continue to hold tension on the string, begin winding the string around the shaft. 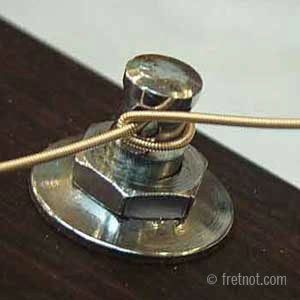 The string should be wound down the shaft to increase the strings angle over the nut. Copyright © Fret Not Guitar Repair Inc.